In the scorching heat of summer season, what can be better than diving into a pool of cool water and enjoying a few mocktails? 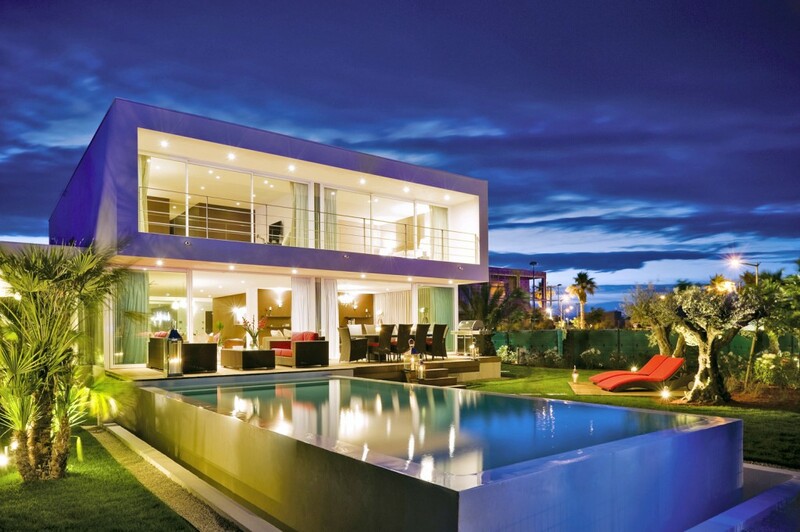 Having a swimming pool outside your home or even inside the walls is a big style statement these days. Who would not love to wear the swimming costumes and dive into the waters for a splash in the killing heat of summers? But it is not an easy task to get a stylish swimming pool at your home. The standard for swimming pools has been raised quite higher by people around the world, and especially by these swimming pools that we are going to dive in today. Located in Kea town of Greece and standing on a hillside, this swimming pool overlooks the Aegean expanse and gives you a breathtaking view of the landscape outside. This pool is located in a private terrace and it seems that the pool hangs in the air to give you a mesmerising view of the sunset. In this pool, you will feel as if you are fully immersed in the sea and you won’t even feel like coming out ever in life. Along with the rustic touch of the walls surrounding the pool and the warm lighting, this pool is a bliss for swimming lovers. 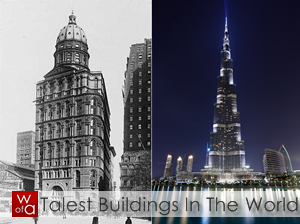 Yes, we are going to some exotic locations to witness some amazing swimming pools. 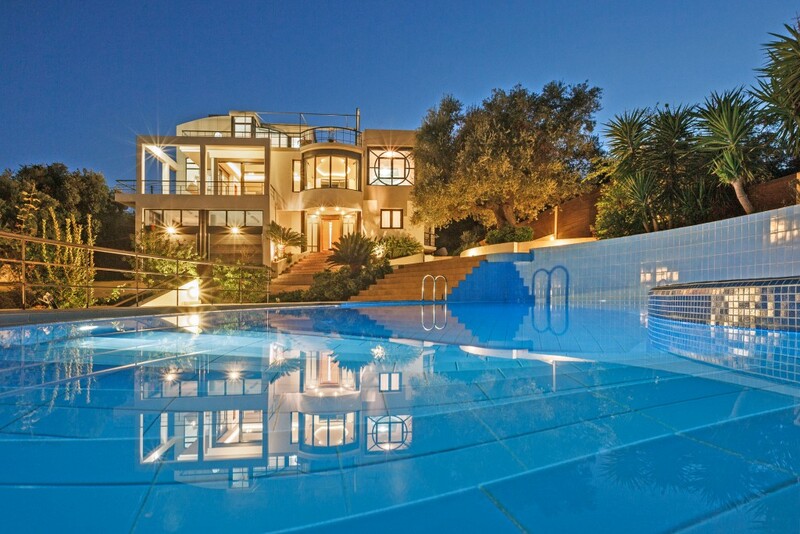 Located in Crete, this swimming pool is adjoining a spectacular villa. The extensive pool offers an amazing view of the Crete’s Venetian Harbour too. The location of the pool just outside the front of the villa adds an enigmatic touch to the pool as one can immerse into the waters to adore the building owned by one. For your villa, you can also have a pool on the same lines and can construct it right in front of the home you stay in. This will be an amazing idea for your home and swimming pool. What does it feel like going to a wonderland, where you have a swimming pool amidst hedges and gardens? This is exactly what it feels like when you dive into the pool of a Spanish Colonial Revival made in 1934. 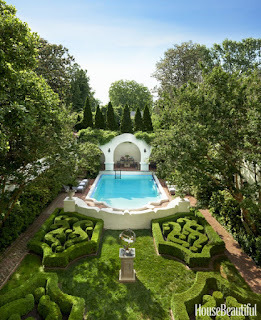 The swimming pool, the pool house and the astonishing boxwood parterres are attributed to the late Richmond Garden designer Charles Gillette. Just imagine the grandeur of this pool as it is flanked by well maintained hedges and a stunning park on all the sides. It will seem to be in nature’s lap while swimming in this pool. The landscaped hedges add a different magic to the swimming pool experience. Why to keep the decor boring when you can pep it up using the same colour as that of the swimming pool? This Southampton House has its interiors coloured in blue, to match with the colour of the swimming pool. 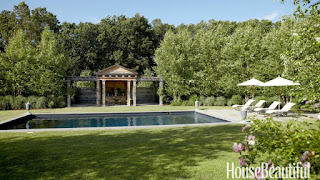 The designers Kim Coleman and Michelle Green have added blue cushions on the Janus et Cie poolside furniture. This also matches the clear blue sky over the swimming pool. Imagine the grandeur of the place as you submerge yourself in the beautiful aesthetics of blue and have a serene pool to match with the interiors of the villa. Moreover, this swimming pool design can be a fit for your villa too as it may take less investment to turn the interiors into blue colour. This swimming pool designed by the Purple Cherry architects is a stunning piece of architecture of swimming pool. Dazzling lights and beautiful iconography make this swimming pool look out of the world. Moreover, this swimming pool is an indoor one. It will certainly feel as if you have entered a spa in one of the most exotic locations of the earth. Along with its violet coloured swimming pool and beautiful wooden interior design, the swimming pool adds a touch of royalty in the matters. In case you want to just bask in the moment, you can opt for the white coloured bean bags kept at a side. You can opt for this design of swimming pool for your amazing villa and you know it will be a worthwhile investment. The swimming pool shown here is designed by Bereco. This swimming pool looks like the entire room is filled with water. It will give you an immersive experience as you dip your body into the water and relax in the moment of your life. The interior decor done in off white colour along with serene nature of the pool will make you feel royal and powerful at the same time. The swimming pool is also flanked by places of relaxation and in case, you want to share some moments of laughter with your close and loved ones, you can do so in full privacy as the swimming pool is an indoor one and the walls give you complete privacy in all matters. When swimming in a pool, it must seem like you are floating in a natural water body. 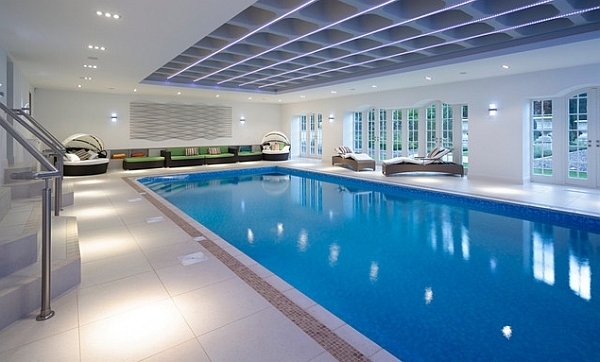 This luxurious and beautifully illuminated swimming pool is an indoor one and is in a French Chalet. You can have such a swimming pool at your home and you will be assured of a surreal experience. The wooden ceiling and the closed interiors with no windows or facility to peep outside will give you a feeling of being inside a luxurious cave. 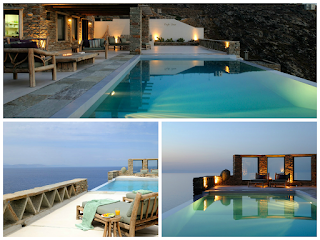 What is better than this swimming pool to have a hedonist experience? This is the swimming pool of Villa Occitane of Languedoc. This is a beachfront villa with an idyllic swimming pool. You can gaze at the amazing aquamarine sea from this villa. Moreover, this swimming pool in France seems like it is specially carved out of earth rather than the swimming pool being immersed in the earth. The modular and minimalist design suits this swimming pool and will be a perfect fit for your beachfront villa too. How would it feel like to be surrounded by tall trees, forest cover on all sides and taking a backstroke? This is exactly what it feels like when you swim in the English Garden of the country residence of Prince Charles at a Greek temple garden folly in Highgrove House. And this is what has inspired the swimming pool we have shown you here. 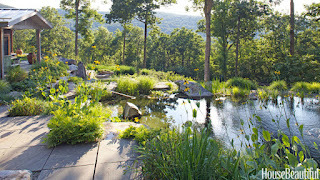 This swimming pool has been inspired from the royal swimming pool and has been designed by Brian McCarthy’s Kerhonkson. 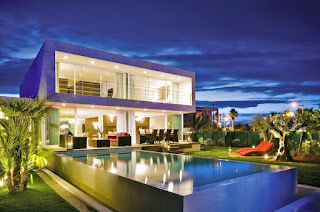 If you believe your villa is less majestic, the go ahead and have a swimming pool of the same or similar design. If swimming has to be a natural experience, then it must be done in a natural way. Floral designer Wendy Goidell has designed this swimming pool which looks no less than a natural pond or a swamp. But don’t worry. The waters are clear and it is a part of a grand villa. If you want to be audacious and want to feel like amidst some wild plants while swimming, then go ahead and get such a swimming pool for your villa too. Swimming is an immersive experience and is best done in the amazing swimming pools we have shown here. Which one are you going to dive into first now?